Move over Fangio, Denise is on the track! 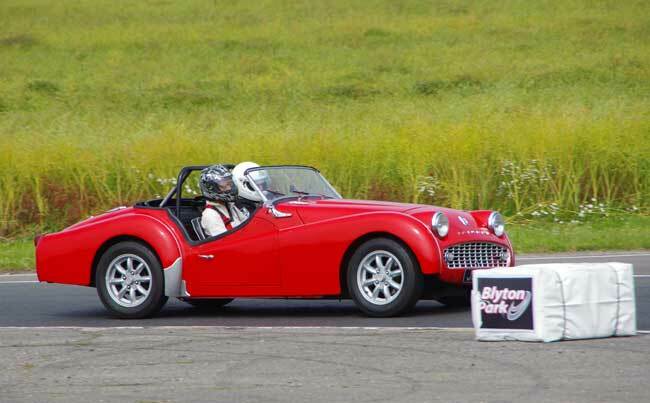 Driving the TR3A on the open road is great fun but we bought it with the intention of also using it on the track from time to time, so when the opportunity came we booked ourselves onto a TR Register Track Day at Blyton Park on Lincolnshire. Whilst I don’t think that either of us is completely ready for F1 just yet, and the Triumph didn’t seem to have quite the poke of some of the other cars on the track, we had a great time storming around the relatively short circuit trying to keep out of the way of our fellow enthusiasts. The TR behaved magnificently throughout the day, though the smell of overheating brake linings and rapidly thinning oil reminded us that any 56 year old vehicle deserves to be treated with respect – unless of course you have deep pockets. Denise on one of her early laps and accompanied by Simon from TR Enterprises – hopefully the poor chap will recover soon! A very enjoyable Saturday was spent with the Lunt family who, as usual, were wonderful hosts, accommodating and feeding us royally and taking us off to a fascinating garden at Hall Farm in Harpswell. Our visit just happened to coincide with an Archaeology Day where we learned the answer to the age-old question ‘when is a Saxon wall not a Saxon wall?’ and were given valuable instruction on how to extrapolate medieval living standards from a single shard of pottery. 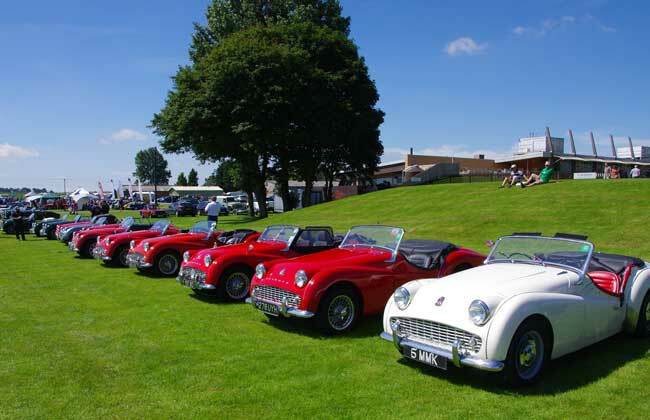 On Sunday morning we were once again up to our metaphorical nuts (and bolts) in Triumphs when we spent a few hours at the very well organised TR International weekend at Lincoln Showground. What can I tell you ……… there were lots of Triumphs. Now, where did we park the car?